34.5% of 9th-12th grade students reported having used alcohol in the past 30 days. This is higher than the state average of 29.9%. Binge drinking is a high risk form of alcohol use that involves the consumption of five or more drinks within a couple of hours. 21.5% of 9th-12th grade students reported binge-drinking in the past 30 days. This is higher than the state average of 16.8%. The most prevalent categories of misuse include opioid pain relievers such as oxycodone (Oxycontin) and hydrocodone (Vicodin) and stimulants such as methylphenidate (Ritalin). 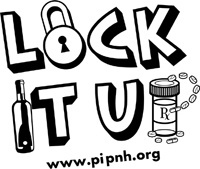 The Lock It Up Campaign was developed by the Partners in Community Wellness (PICW) Regional Network to raise awareness of the issues of prescription drug abuse and underage drinking. Students from Belknap County created the artwork for the logo. Lock It Up addresses two important components of the problem: SOCIAL ACCESS & AVAILABILITY. The majority of underage drinkers obtain alcohol from friends or family – with or without permission. By keeping alcohol locked up, parents make it unavailable. In addition, the majority of people who abuse prescription drugs, obtain them from family or friends, again, most often times ‘helping themselves’ from the medicine cabinet. When prescription medication is locked up, it is unavailable to those who do not need it for medical reasons. The Core Youth Leaders who designed and developed the artwork and public service announcements for the Lock It Up Program. Funding Provided By: NH Bureau of Drug and Alcohol Services and the Strategic Prevention Framework State Incentive Grant. A website designed to help individuals, families, and communities to get informed, get involved and get help! You will find information on prevention efforts, effects of alcohol and other drugs, guidance on recovery and treatment and links to programs in the Granite State. . .and more. Resources for Parents & Grandparents, Health Care Providers, Community & Law Enforcement and Educators. A parent's guide to the legal drugs kids are using and abusing. The prevention campaign Stop Medicine Abuse.org and its Five Moms initiative is working to alert parents and members of the community about the problem of teen abuse of over-the-counter (OTC) cough medicines containing dextromethorphan (DXM). For more information, contact Kelley Gaspa, Director of Prevention & Intervention Programs, at (603) 528-2145 or kgaspa@pphnh.org.